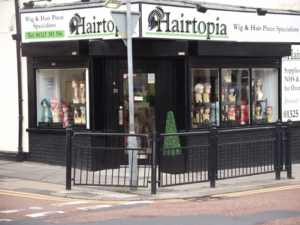 Welcome to the all-purpose, easy access hair accessories and wig shop in Duke Street Darlington. Come in and transform yourself with scrunchies, hairpieces, human hair extensions, synthetic wigs and much more, plus you can also explore our exciting range of party wigs, a great low cost alternative to hair dye – faster and instant removal. You are welcome to visit our specialist shop, store and fitting area in Duke Street, Darlington. Come and browse our specialist selection of hair accessories from hair clips and headbands to party hair and specialist wigs. Specialists in custom made/bespoke wigs and hairpieces for human hair in any style, any colour, any size and length. From a patch to a full wig – your hair, your design, and carried out by fully trained and qualified technicians for custom made human hair. All wigs fitted by hairdressing stylists and cut and styled to suit.